information is required it can be continued on page 2 block 24. Please fill in the date of the event: (example) “20150901. Please fill in time of the event: (example) a. From: 1200 b. To: 1500. Please fill in the title of the event: (example) Bay County Veterans Day Parade. 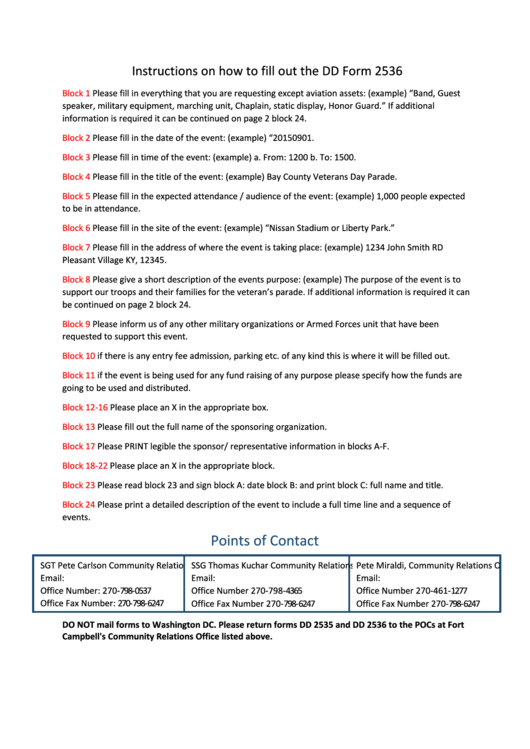 be continued on page 2 block 24.
requested to support this event. if there is any entry fee admission, parking etc. of any kind this is where it will be filled out. going to be used and distributed. Please place an X in the appropriate box. Please fill out the full name of the sponsoring organization. Please PRINT legible the sponsor/ representative information in blocks A-F. Please place an X in the appropriate block. Please read block 23 and sign block A: date block B: and print block C: full name and title. Campbell's Community Relations Office listed above.